Neil Jenkins says England will feel the pressure of being World Cup hosts when they play their opening game. 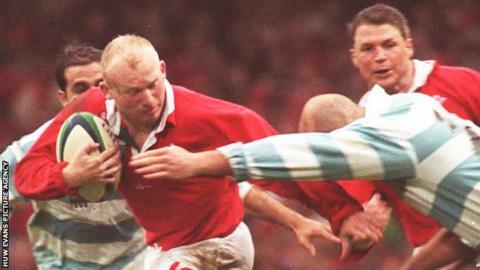 Wales' kicking coach and record points scorer played in the first game of the 1999 tournament in Cardiff. England kick off their home tournament against Fiji on Friday and Jenkins says it will be a new experience for them. "I certainly felt it back in 1999 against Argentina. There's going to be a lot of pressure on England that's for sure," he said. "When we were the host nation there was a fair bit of pressure on us and a lot expected of us and Argentina were a pretty good side as well." Wales came through that game to win 23-18, but were eliminated in the quarter-final by eventual winners Australia. But Jenkins, who scored 1,049 points for Wales, says it will be an intense experience for he English players. "They're going to be expected to do well and there's a huge amount of pressure on them but again you live to deal with that," said the former Pontypridd and Cardiff fly-half. "England are a very good side and I'm sure they have worked out ways to sort of minimise the pressure on them. "But you can't hide from the fact you are the host nation you are expected to do well and teams are there to knock you off." "We'll certainly be trying to in a couple of weeks." Wales start their campaign against Uruguay on Sunday before facing England, Fiji and Australia in Pool A. They go into the tournament without their leading place-kicker Leigh Halfpenny who underwent an operation on a damaged knee this week, but Jenkins believes fly-half Dan Biggar is a more than able deputy. "Leigh is one of the best in the world if not the best, and Biggar is incredibly close if not on a par, so we're lucky to have someone of his quality to come in and do the job he does week-in, week-out for the Ospreys," added Jenkins. "I'm sure Dan will back himself against Leigh in terms of distance. "He's a world-class kicker and we know that, so we're not overly worried about that. "And look, if it's out of his distance it's simple, we'll go to the corner and try to score from there." Jenkins added that the other fly-half in the squad - Bath-bound Rhys Priestland - has also been working hard on his place-kicking and was setting a high standard in training.